I completed another pin, woo hoo!! How yummy do these Apple Cinnamon Crescent Rolls that Lindsey over at Love, Lindsey shared on her blog look? Awesome right?! the picture that Lindsey so kindly posted is also posted on my blog. My bad. I made these beauties for my Friday Morning Ladies Bible Study last week and they were a HUGE hit! Super easy too. I peeled and sliced the apple, soaked them in OJ so as not to get brown, and then wrapped them up with cinnamon and sugar and popped them in the oven. 12 minutes later I tossed them in a serving bowl and walked out the door. I highly recommend this recipe. Super yummy! 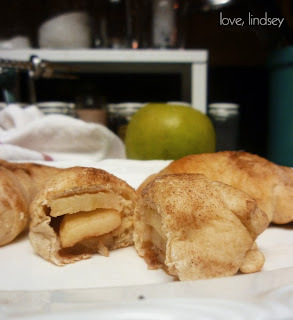 Yum, these look so yummy, crescent roll recipes are so fun! Sounds delicious!! Thank you for sharing at Sharing Saturday! Have a great week!! Thanks for sharing I am totally trying this! They look lovely and sound nice and easy to make too!